Like a snowflake, each person is different and unique. Or at least, they used to be before the Protectosphere was put into place. Welcome to Neva's world. A world that claims to protect its people, but has dark secrets hidden beneath the surface. Neva and her friend Sanna know something is wrong. They aren't going to let things go. So begins the story of Neva's revolt. 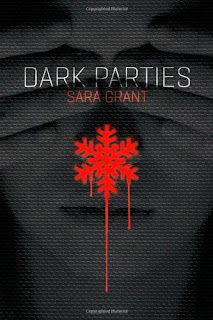 Now what I loved about Dark Parties is that it drew me in from the very first moment I started to read. In fact, this book is so fast paced and filled with twists, deception and action, that there is hardly a moment to breathe! I didn't put this down once while I read it. That's how amazing it really was. The world under the Protectosphere is different enough to feel dystopian, and yet Sara Grant allows it to have just enough of a link to our own that it is unnerving. Deliciously so. Neva was a superbly written character, and I loved her fire. Despite everything that comes her way (and there is a lot) she always refuses to back down. However what really made me connect with her was her refusal to let her own needs outweigh that of the others she is around. Neva makes tough decisions in this book, but they are almost always completely unselfish. She's amazing! I won't spoil it, but the one thing that eats her up inside most has to do with Sanna's friendship. That alone made me feel like Neva was a real person, and not just a fictional character I was reading about. She has doubts, she is flawed, and I adore her. The one thing I missed while I was reading, was more about the world that Neva is in. It is explained enough to make you understand why she feels so stifled and bent on rebellion. However the action takes the reins a lot of times, and things are left out. There were times that what I was reading felt a bit jumpy, as if there was a race going on to fit everything important in before the end of the book. It was fleeting, but I was kind of hoping to find out a little more about the government that was so viciously hunting down Neva. Still, overall I really enjoyed this read! As I mentioned, I devoured Dark Parties from start to finish without a break in between. It's that well written. Despite the small things I felt were missing, I'd rank this as a read that is not to be missed! Neva and Sanna's world has the possibility of coming to fruition, and that is what is most terrifying of all.